Repairs101.ca: Painter Hitch - The best knot for lines, leashes & leads requiring quick release! The knot most used by cowboys and sailors alike for quick release - collapses instantly to free a spooked horse or a boat tied to a pier with a rapidly falling tide. Good for dog leashes, too. 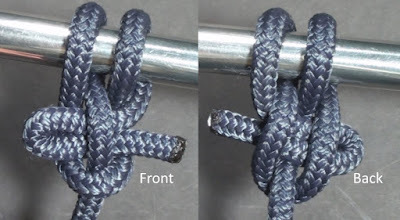 Alright so today on Repairs101 I’m going to show you how to tie a Painter Hitch which is an excellent quick release knot used for tying up leads or leashes or even the painter on your boat. There are a few ways to approach tying this knot. Overhand, underhand. On a rail or on a ring and that’s just to name a few. 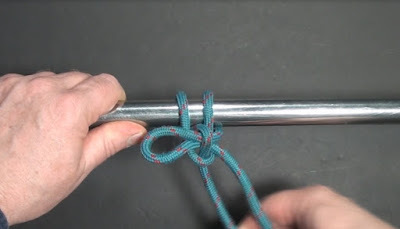 Very simply made by passing a bight over or under the thing that you’re tying on to, pulling up on the standing part of the line to create a bight that crosses through that and then pull a bight off the tail end and lock it down with that. So you make a bight out of the rope and pass it around. Make a bight through the first one out of the standing part of the line and then a final bight out of the tail end to finish it off with a quick release handle. 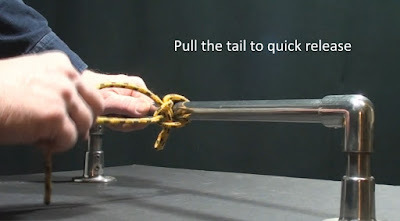 So in making this video I tied and shot this knot about a hundred times and in so doing I discovered that no matter what little variations I made - as long as I made a bight out of the rope, passed a standing part bight through that and passed a tail end bight through that – then the knot would bind.